Looking for a book that’s beautifully written, yet absolutely gruesome? Try The Madman’s Daughter by debut author Megan Shepherd. From Goodreads: In the darkest places, even love is deadly. Sixteen-year-old Juliet Moreau has built a life for herself in London—working as a maid, attending church on Sundays, and trying not to think about the scandal that ruined her life. After all, no one ever proved the rumors about her father’s gruesome experiments. But when she learns he is alive and continuing his work on a remote tropical island, she is determined to find out if the accusations are true. Accompanied by her father’s handsome young assistant, Montgomery, and an enigmatic castaway, Edward—both of whom she is deeply drawn to—Juliet travels to the island, only to discover the depths of her father’s madness: He has experimented on animals so that they resemble, speak, and behave as humans. And worse, one of the creatures has turned violent and is killing the island’s inhabitants. Torn between horror and scientific curiosity, Juliet knows she must end her father’s dangerous experiments and escape her jungle prison before it’s too late. Yet as the island falls into chaos, she discovers the extent of her father’s genius—and madness—in her own blood. Inspired by H. G. Wells’s classic The Island of Dr. Moreau, The Madman’s Daughter is a dark and breathless Gothic thriller about the secrets we’ll do anything to know and the truths we’ll go to any lengths to protect. And then there were the twists and turns… I won’t say too much for fear of ruining the surprises for you, but there were a few big reveals in this novel that caught me off guard The ending, especially, left me blinking in shock. I’m definitely looking forward to the next installment of this series. Yes, that opening scene was bananas. I can’t wait to see what becomes of Juliet. The way she was left at the end of this book… Um. There’s really nowhere to go but up! 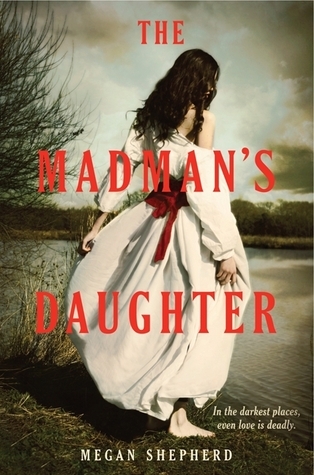 I just finished reading THE MADMAN’S DAUGHTER earlier this week and really enjoyed it as well. In fact, I’d have to say it’s the best debut I’ve read so far. I didn’t know it was a trilogy until after I finished, so when I got to the ending I nearly shrieked out loud. Can’t wait for the sequel! And now that I’ve read your lovely review, I need to get working on mine. I can’t wait to read this! Ahhh so many books!! This is on my DAC list–none of which I’ve read yet because I’ve been busy reading sequels to 2012 books. Maybe I’ll tackle this one first 🙂 Great review by the way. I love the sentences you pulled out of the story. Thanks, Liz. Megan Shepherd really does write beautifully. I’ve only read three books from my DAC list, mostly because just like you, I’ve been catching up on 2012 books and reading some amazing 2013 sequels and follow-ups. I’m in the middle of THROUGH THE EVER NIGHT right now — SO GOOD! Me too, Katy. I REALLY want to read this book – the cover hooked me, the premise hooked me. And now I definitely want to read it after reading this! I hope you love it, Alison!